Many people have boarded the ship in Yokohama and Kobe and the Ocean Dream has now set sail from Japan! 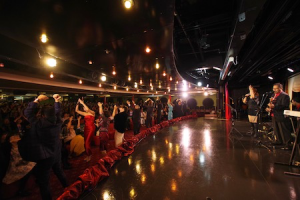 Today the Welcome Party was held onboard, and participants dressed up in their colourful formal wear to enjoy the exciting atmosphere with various events taking place around the ship including the welcome ceremony, a ballroom dance party, and photo session with the Captain. 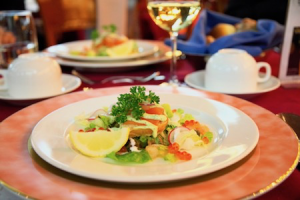 The Ocean Dream is like a hotel sailing at sea, with life onboard supported by staff and crew members including the restaurant staff who prepare delicious meals, and the housekeeping team who ensure the cabins are comfortable. The staff and crew members were introduced on stage during the welcome ceremony. 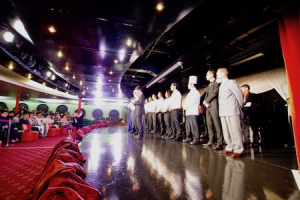 The ceremony closed with a live performance from the onboard band. Participants used this opportunity to greet the people next to them, making new friends and kicking off the voyage together. Following the ceremony, the welcome dinner took place in the Regency Restaurant. 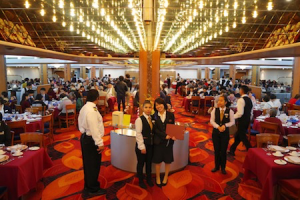 This was a chance to get to know more people onboard and enjoy the dinner together. Making new friends every day is one of the special parts of a Peace Boat voyage. “Looks delicious!” You could hear people exclaiming this as the courses were brought to the table. Today’s menu included salmon, steak and dessert. Participants enjoy the first days at sea and the final days of 2018 to begin their journey together. 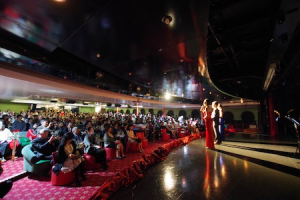 [99th Cruise Report]The 99th Global Voyage for Peace returns!